How Much Cash Should Your Small Business Keep in Savings? If you have a small business you know how important it is to have sufficient cash flow. You need cash for everyday expenses such as payroll, rent, utilities and supplies. Some financial advisors recommend having up to six months in operating expenses to be safe. The exact amount you need, however, depends on the amount of cash that typically flows in and out of your business. 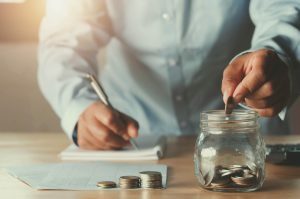 Let’s look at some of the criteria you need to consider when calculating the amount of small business savings you need. The amount of savings your business needs is directly related to your cash flow. Look at recent cash flow reports and see how much cash you’ve been receiving and spending. There are a few different numbers you can use to identify the state of your cash flow. One of the most useful is the gross burn rate, which only looks at your expenditures and not sales or income. You can make estimates about your future cash needs based on the past performance of your business. However, your future expenses may change. For example, if you plan to purchase new equipment or hire more employees a month from now you know that your gross burn rate will be rising. If your business is growing you may also need to purchase more inventory. Don’t forget to include all such expenditures when calculating your cash needs. Expenses are generally more predictable than sales. Most businesses go through cycles that are influenced by seasons, industry trends and unpredictable upturns or downturns in the economy. Expenses, on the other hand, are fairly stable. You have to pay your employees and rent no matter how business is going. That’s why it’s important to have sufficient savings to weather any downturns in business. Can You Raise Additional Funds? Because business can be unpredictable, it’s reassuring to know you can raise additional cash if necessary. This is especially true if you find you don’t have as much cash savings as you’d like. You may be able to get cash from personal bank accounts, liquidating assets or applying for a bank loan. It’s good to be aware of how much you can raise before you actually need it. When it comes to bank loans, keep in mind that it often takes at least two months to get funds. This, of course, is assuming that a bank actually approves your application. If you aren’t confident that you have sufficient small business savings you may want to look into other sources of cash. These may include borrowing money from relatives, using credit cards or home equity loans. You can also look into ways to reduce your business expenses. You might, for example, consider renting rather than buying equipment. Another source of back-up cash flow is invoice factoring. Invoice factoring turns unpaid invoices, or your accounts receivable, into immediate cash. Some factoring companies, such as Riviera Finance do not have monthly minimums, this means you can choose to factor invoices when you need extra capital. Unlike a loan, you don’t take on additional debt. Invoice factoring is a way to stabilize your cash flow so you can more easily meet your expenses. It can also be a source for back-up working capital. Riviera Finance is one of the industry leaders in this field and has been providing financial services to businesses of all sizes for almost 50 years. To find out more about how invoice factoring can help you enjoy better cash flow, contact Riviera Finance today.